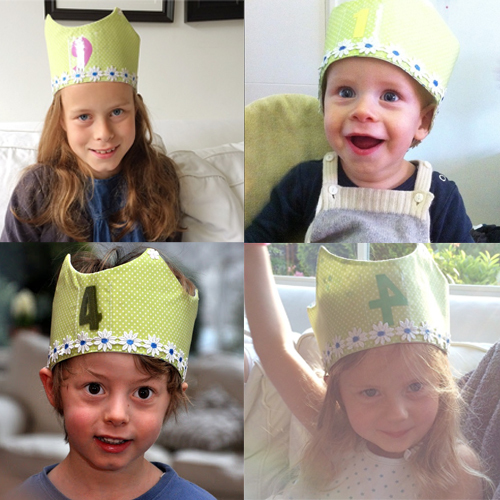 In the Netherlands, it’s a tradition to give a child a birthday crown for the day when it’s his or her birthday. Typically it’s a home-made, simple crown made of thick paper, decorated with some curls and colours and usually there’s the number with the child’s age glued on it. When the child is old enough to go to school, the teacher in class will make the birthday crown for the child, who will be so proud to wear it during the day! A long time ago in a little shop in Antwerp, Courtney and I bought sweet fabric crowns with a plastic sleeve in which (felt) numbers can be inserted. These crowns have really become part of our families’ birthday traditions. The morning of the birthday, the crown with the correct number will be waiting next to the presents and a decorated chair. It’s become so much a part of the party! Do you have any special birthday traditions in your family or in your country? Maybe you know the birthday crown as well? I would love to know — I love family traditions! Here in Mexico we celebrate with a really big party where all family and friends gather; there’s a huge cake so everyone can get a piece, a huge pińata full of candies and enough food for everyone…it is quite a day full of noise, music, fun & lots of presents! Love this idea. I’ve been on the search for a felt birthday crown that I can reuse year after year (i.e. with a place for a number to be placed inside). Ideally one that is also gender neutral. Any idea where I can order one?! Thanks so much. In Germany, when I was little, I used to have a flower wreath made from fresh flowers. They made for very pretty pictures. I have adjusted that tradition a little bit and we have a colourful paper flower wreath. I love that idea! How sweet!! This is a tradition in Spain too! They make the kids a crown in school and sometimes kids wear them to their parties. My son is going to turn two in a month and it may sound crazy but I’m really looking forward to seeing him in his crown. We do crowns too! On the first birthday of each of our children, they pick out the colors of wool felt they like (with a bit of help from older siblings/mama/daddy). I sew it into a crown…adding their name/initial and a button. Each year they pick out a new button to signify that year…or just the “best button” and we add it the morning of their special day. They get to wear it all day…or week or month. The crown is secured with elastic so it expands to fit long enough for them to tire (sniff, sniff) of the tradition before it doesn’t fit anymore. The one thing that unifies all our birthdays is ice-cream… we always go out for an ice-cream cone… no matter what the weather, no matter where we are in the world… it can be a simple cone or a freshly made salon… we always always go out for ice-cream on somebody’s birthday. Oh, I really like this idea. Very creative!